Our headquarters, one of many Martin-Baker facilities in the UK, are located on a wholly company-owned 22-acre site in Higher Denham, some 30 miles north-west of London and 10 miles from London Heathrow. Our Denham headquarters are deeply rooted into the history of Martin-Baker as we’ve been at this site since 1929, back when the company was still designing and manufacturing aircraft. A lot has changed since 1929 – countless new buildings have been erected and we’re always expanding operations, but the rich history of the site can be still be found throughout. The Martin-Baker HQ is a hive of activity, with management of all aspects of the Company’s business being handled at this site, as well as design and development engineering, manufacturing and environmental testing. Martin-Baker also has a manufacturing, support and testing facility not too far from Denham at Chalgrove Airfield, Oxfordshire. This is where the countless iconic photographs are taken of our ejection tests out of the two refurbished Gloster Meteors at mid-range altitude. 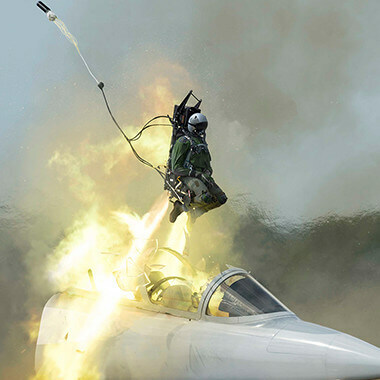 All of the pyrotechnics that go into a Martin-Baker ejection seat are manufactured here by a highly skilled and dedicated team. Finally, our rocket-sled test track takes us back to Sir James’ roots and is located at Langford Lodge, Northern Ireland. This state of the art track allows us to conduct all range of speed tests for Martin-Baker ejection seats. The 6,200ft track has been in service since 1971, and can accommodate all aircraft types to provide the exacting results that customers demand. All of the cockpits that are fired down the test sled are handmade by Martin-Baker employees.